When it comes to exhausts, we’re simply the best in the business. We are the OG’s, many have copied our designs. That’s a bold statement, but we back it up with better designs, stronger welds and materials, and smarter engineering. Go ahead and compare, we’ll be here when you come back. 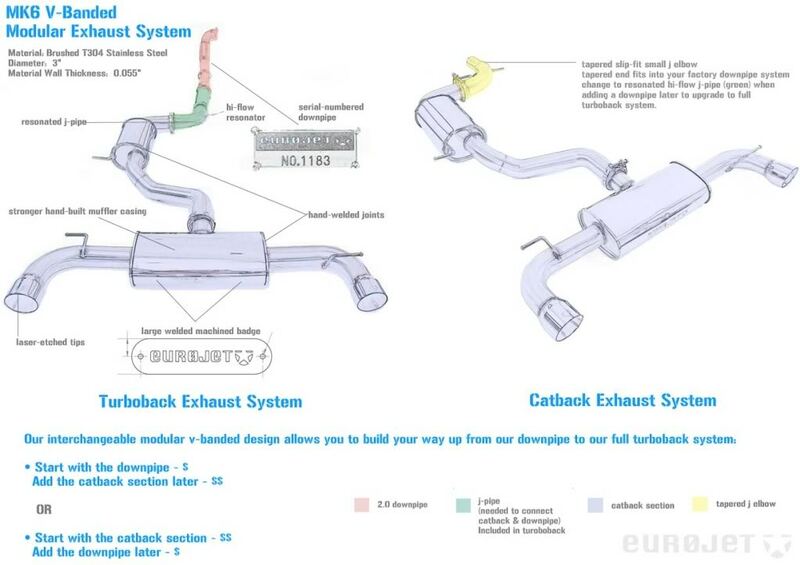 Eurojet™ exhausts are modular—meaning that you can pick and choose which components fit your needs and your budget. No matter what you choose—a downpipe, a catback, or a full turboback—the parts are precisely engineered to easily fit together without additional welding or custom parts. Just a simple turn of the wrench and you’re done. Our Gen2 exhausts include even more features that improve sound quality, exhaust flow, and overall reliability. Note that our Gen2 exhaust products may require minor modifications for compatibility with Gen1 systems. Each system is designed in 3D CAD to ensure exactness with each bend. That means each bend is precise, hangers line up, and your exhaust fits right the first time. Once the pipe is bent and pulled from the mandrels, we line up each pipe and weld the flanges and pieces together on model specific jigs and molds. This guarantees exactness with each and every system and promises high-quality performance through design and precision. We design all of our mufflers to manipulate and create the right exhaust harmonics so that you’re turning heads on the street and the track for all the right reasons. With our proprietary chamber designs and muffler technology, we’re able to turn your exhaust system into an aggressive beast without waking up the neighbors or getting any other unwanted attention, while putting down the power you demand from a performance exhaust. For more technical information, see the MK6 Gen2 Exhaust System White Paper. Many Eurojet related products are sold for off-road use only. All performance modifications and installations are at the customers own risk. Eurojet holds no responsibility either implied or otherwise for mechanical, electrical or other failure when using any aftermarket performance products. Items sold for off-road use only are illegal in many states and provinces and are intended for racing vehicles which may never be used on a public road. By purchasing any aftermarket performance product, the customer takes full responsibility for any use, and/or misuse of the product and agrees that Eurojet holds no responsibility for any consequences, legal, or other, of such use and/or misuse. What’s the basic theory behind an exhaust system on a turbocharged car? For simplicity’s sake, we’ll refer to the “exhaust system” as everything post-turbo all the way to the tips at the bumper. An exhaust system is a coordination of carefully measured out bends, engine harmonics, and design that eliminates backpressure from the system on turbocharged vehicles. Our goal is to design and deliver a clean-running, aggressive but non-intrusive, power producing exhaust system…We feel we do a damn good job of it. One very important factor on a properly designed system is the downpipe design. Elevated exhaust gas temperatures (EGTs) can severely hinder performance, so you want a system that does not restrict flow within a close proximity of the turbo. Why? Because the harder the turbo runs, the hotter the EGTs become. High EGTs cause stress to the system, damage and warp the exhaust flanges, and can eventually cause catastrophic failure if left unmonitored. This means that you want a port-matched flange with a downpipe that exits the turbo as straight as possible to allow the exhaust gases to exit as fast as possible. Now, a straight pipe isn’t possible in most cases unless you’re running it straight out of the hood like a drag car, so bends will be necessary. With that in mind, you want gradual bends with the least amount of interference or changes in direction and no sharp angles to allow the gases to exit. Changes create “hot spots,” choke up the system, cause premature wear, and hinder the overall performance of the engine. Our mufflers are designed based on OEM parameters, but with our own proprietary inclusions. We use an E3 high-temperature fiber that is far superior to the regular short fiberglass fibers that most manufacturers use to reduce costs. This ensures longer life, reduces noise, and increases acoustic insulation. The muffler can handle sustained temperatures of 1,200° F, with intermittent temperatures of 1,600° F. Maximum temperatures these mufflers will see in your application should not exceed 700° F.
We also incorporate hangers and flex sections to absorb vibrations that increase the lifetime of the exhaust system. Lastly, a performance oriented exhaust system is a foundational part of the modification process. As your horsepower increases, the need to exhaust gases is also increased. The OEM pipe size and catalytic converters are design for OEM power levels. If you plan on going faster, you’d better plan on getting our exhaust. Why choose 3" diameter for your system? There is a VAST difference between naturally aspirated (NA) and turbo exhaust design. The design of turbo exhaust systems is completely counter to that of NA design. NA is based off of velocity, utilizing it to scavenge cylinders during the blowdown process. To increase the velocity on NA systems, the diameter is tapered and reduced in size, which creates backpressure within the system. It’s a delicate balance on NA design; go too big and velocity and the scavenging effect is lost, go too small and backpressure is killing all the gains made by velocity and scavenging. With that said, turbo exhaust design squashes everything that we just talked about. In turbo cars you want as much velocity created within the turbo manifold as possible (within safe boost levels, of course). The faster the velocity, the faster the spool of the turbo. The faster the spool of the turbo, the faster you need to eliminate the exhaust. In a turboback system, you want the least amount of backpressure as possible. This is why you see many race cars and drag setup with the downpipe rifling out the hood or poking out of the fender. It’s actually functional, not just badass. The intent is to eliminate all pressure post-turbo to make the best use of the pressure that has been built up within the manifold. Get those gases out ASAP! Less Pressure Post Turbo = Maximum Boost Response = Increased Velocity throughout the RPMs. As for 3″…for anything pushing 300 hp, 3″ is your best bet. You are sub-optimal with a 2.5″ downpipe with anything above 250 hp. These are the basics of our exhaust design. We can go deeper into it if you’d like, just give us a call and talk to one of our engineers. What is T304 stainless steel? Stainless differs from mild steel by the amount of alloy or chromium that is mixed with the metal. For example, when mild steel is exposed to the elements and is unprotected (meaning no coatings), moisture and grime permeate the matrix of the metal. Once this occurs, rust forms, and then it’s able to spread fairly easily throughout the metal matrix. Stainless steel has enough alloy content that it creates an oxidized barrier that repels corrosion from spreading into the internal matrix. Why is material thickness important for exhausts? One very important thing to take into account is the thickness of material used when constructing a proper exhaust system. There are many less-expensive stainless systems on the market. However, many systems use thin-walled stainless, some with almost half the wall thickness we use in our systems. Material thickness is not used to combat corrosion—T304 stainless steel already minimizes corrosion. Instead, this thicker material is used to keep excess noise out of the cabin. The material also ensures that the system will not deform during years of the expansion and contraction that occurs during normal operation. Our Gen2 exhausts have a 0.065” thickness, up from 0.049” in previous systems. This thicker material reduces cabin noise and improves long-term reliability. How does the exhaust achieve and maintain its sound quality over time? Pass-through area—We were able to increase the pass-through area of the core from 30% to 40% by adding internal expansion joints and superior sound-absorbing material. Inlet-outlet placement—We changed from an offset inlet-outlet to a center inlet/outlet design, which provided equivalent sound absorption while ensuring consistent temperatures throughout the muffler and minimizing turbulence. Anti-reversion chamber—We added an anti-reversion chamber to stabilize the long sound waves and reduce cabin drone. It has the added benefit of reducing the weight of the rear muffler without reducing the exhaust flow. Tubing—We’ve increased the wall thickness from 0.049” to 0.065” to keep the drone out of the cabin and behind the car. With these improvements, our exhausts deliver a cleaner European sound without any reduction in the exhaust flow. Why is exhaust flow important? The v-band flange design was improved using a male/female flange design to ensure perfect alignment, eliminate exhaust leaks, and prevent condensation sweat. We changed the radius of the bends, increasing the center line radius to increase exhaust flow. What is the advantage of a modular v-banded system over a slip fit system? It boils down to precision and design. A slip fit system gives the fabricator the ability and flexibility of not having to be exact with every bend. V-banded systems demand perfection. They are precise and spot on almost 100% of the time when pulled out of our jigs. They are simple to install, the tips do not hang or fall out of place. The modular system allows for quick and easy replacements and upgrades, and allow the end user complete control over how the systems fits and looks on their car and more importantly what options they decide to choose. How do male/female v-band flanges improve fit and simplify installation? Gender-based v-band flanges self-align, ensuring a smooth matting surface throughout the connection. In contrast, distortion between alignments after clamping for non-gender flanges can exceed 0.25”, an issue that may not be visible because the clamp hides the misalignment. All Gen2 Eurojet exhausts include a male/female v-band flange. This design guarantees that the joint will not leak exhaust or sweat condensation, issues that can occur with v-band connections. Why corrugation within the flex? This added inner sleeve within the flex section prevents premature failure. Braided flex sections without a corrugated sleeve will “puff up” over time and restrict exhaust flow. You will not find this issue on our systems. These clamps have been proven to be the strongest clamps on the market. They’re made out of stainless steel and once they’re tight they’re not going anywhere.